In 1867, the Framers did not include a bill of rights in the Constitution Act. Canada’s constitutional bill of rights, the Canadian Charter of Rights and Freedoms, would only be passed more than a hundred years later. Meanwhile, some judges sought to protect certain individual rights and freedoms, mainly freedom of expression, from undue legislative and executive interference through what became known as the ‘implied bill of rights’ theory. According to those judges, a right to freedom of expression could be inferred from the preamble to the 1867 Act which refers to ‘a Constitution similar in Principle to that of the United Kingdom’. In this vein, they would have used relevant English legal principles as a source of inspiration, especially with regard to the view that freedom of expression is a fundamental principle of the English tradition of civil liberties and that the courts should act as its guardian. 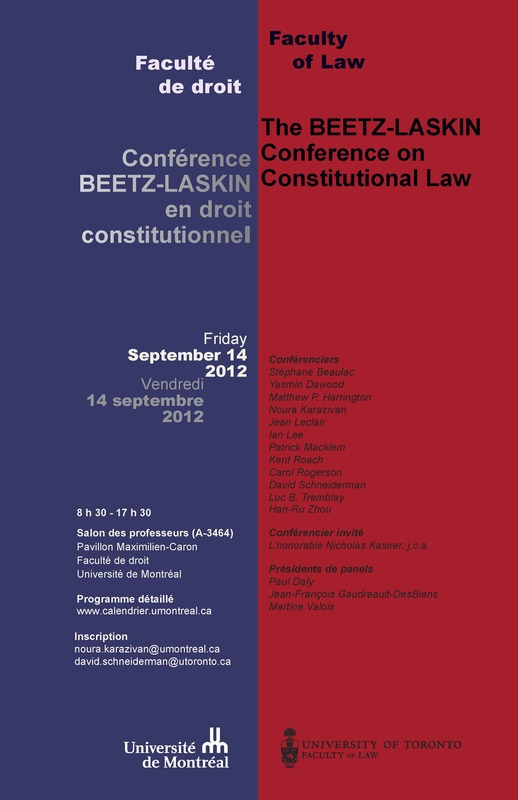 In light of the influence of English constitutional law and theory in the development of freedom of expression in Canadian law, the presentation will discuss the two main competing positions concerning the nature of the implied bill of rights theory before suggesting that it has eventually become part of Canadian law. This content has been updated on 18 July 2017 at 17 h 51 min.